According to the World Health Organisation 350 million people worldwide are suffering from depression. Positive psychology, known as the science of happiness is the study of optimal functioning and a new branch in psychology that came along at the turn of the 21st century to re-balance the field, which had become overly focused on therapy and what’s wrong with people and had lost sight of the positives, such as what makes you happy. Positive Psychology For Overcoming Depression is aimed at anyone suffering mild to moderate episodes who would like to get better using natural antidepressants. 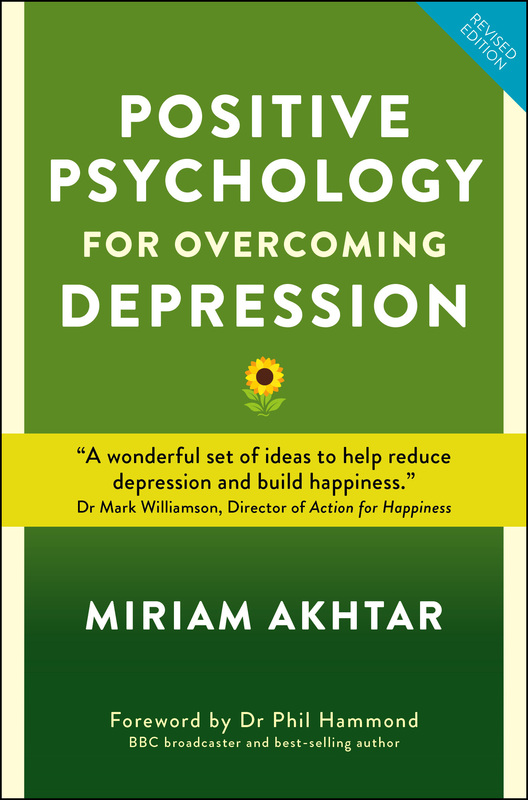 Its author, Miriam Akthar is a leading positive psychology practitioner in the UK and is one of 100 global experts invited to contribute to the World Book of Happiness and its follow-up the World Book of Hope. Growing Your Resilience – bouncing back after a trauma and the ABC of resilience (adversity, belief and consequences). Savouring The Moment – The power of slowing down and basking in good things. The 6 Element Model of Wellbeing and the 40% Equation – 40% of your happiness is under your control. Positive Connections: Other people matter – Cherishing relationships and the power of forgiveness. Learnt Optimism – Psychological self defense and the power of expecting a positive outcome. The practices suggested throughout the book are based on scientific research; a new bibliotherapy study by Sheffield Hallam University has provided evidence that the techniques really do work, helping people to overcome depression and improve their well-­‐being. The chapters cover a variety of techniques in recognition of the fact that depression is unique to each sufferer: different tools work for different people. The text is written in a highly approachable style as Miriam has lived experience of depression and knows first-­‐hand that, when you’re feeling low you need something that’s easily accessible. The text explains key strategies to help you not only overcome depression but also reduce the chances of it occurring or recurring. As such, it acts as both prevention and cure. As you practice the simple yet highly effective techniques, you will find your mood lifting, your resilience, positivity, confidence and strength growing, and your outlook becoming more optimistic. These strategies come from the author’s professional knowledge and practice in positive psychology, and her background as someone who has suffered from depression herself. Definitely not the one to be missed, grab your copy today!